If you are looking for a perfect gift for Valentines Day for your Love, a sweet and romantic adult coloring book is a perfect gift. Hearts and flowers, chocolates and long walks on the beach all bring romance to mind so lets explore what coloring books you can give. New coloring supplies to go along with the gift would be another option. Your sweetheart can take this perfectly portable book along with them. Let There Be Love feature clusters and cascades of heart motifs embellishing trees, balloons, teapots and cups, bouquets, and other fanciful renderings. All Creative Haven books have perforated one-sided pages for easy removal and display. This book is a collaboration of several artists so you’ll enjoy many different styles to color in. It also includes a link to a PDF so you can print the pages again. You can’t have a curated list of romantic coloring books without mentioning this trio. Illustrated by Eriy in a unique way by using toothpicks to draw the illustrations. Please note that Sherri Baldy’s coloring books are always filled with adorable girls, this one featuring lots of hearts but the paper is Createspace and quite thin, luckily, none of her images go into the crease so if paper quality is important to you, you can easily copy her drawings to cardstock. This Creative Haven book has images of hearts surrounded by delicate flowers, butterflies, stars, and other romantic motifs. Lindsey Boylan specializes in illustrations on a black background and of course the images are one-sided & perforated. New colorists and old adherents to the coloring phenomenon will fall in love with Daydreams (Dagdrömmar) Coloring Book with 85 intricate illustrations: delicate flowers, buzzing bees, storybook homes, regal portraits, and more. This 96-page hardbound edition lends a luxurious feel, encouraging artists to display their volume on a coffee table or bookshelf. I found this gorgeous botanical coloring book while I was on vacation in NYC and I was so happy that I had plenty of room in my suitcase for it as I didn’t want to wait one more second. It’s beautiful beyond measure and then lets talk about the PAPER!! Thick, thick with easy to remove pages perfect for those of you that like to take pictures out to color and then display or frame. These would make fantastic works of art for your home or for a gift. “Floribunda ” contains 20 pages of illustrations and an introductory page as well as front and back colored images which are great examples if you are new to shading flowers. It measures 10 by 13 inches and is glue bound into a colorable matte finish cover. 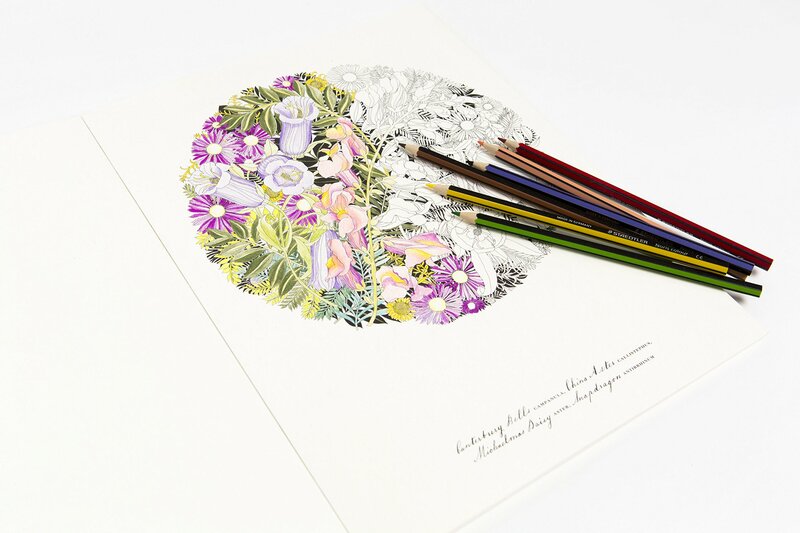 It features black and white botanical illustrations. All you marker people out there. THIS is the book for you. Copics, Spectrum Noir, Tombows, Sharpies whatever you coloring passion. “Secret Garden” started it all, so if your Valentine doesn’t have it in their collection yet, it’s the perfect gift for their collection. I really can’t say enough wonderful things about this gorgeous book from illustrator Eleri Fowler . I get many books to look at from the artists and publishers but was blown away with the quality of this beauty. It is indeed a joy to color in. The pages are excellent quality with pages that actually fold down completely flat to color those two page spreads. The images are beautiful, original and very well put together and combines not only beautiful flowers but also inspirational sayings. I started with the title page and played with white Uniball gel pens for the first time for the dots and extra details on the flowers. All the beauty of coloring with chalk but without the mess! These 32 gorgeous hand-drawn floral designs feature all of the charming imperfections of original chalkboard art. Relax and fill them with color to create your own rustic-chic masterpiece. Each whimsical white line illustration is presented on a textured black background, just like a real chalkboard. You ll be delighted by the way warm colors, bright colors, neons, and lighter pastel shades really pop from these designs. Use light-colored pencils and gel pens to personalize your work with lettering, flourishes, and patterning. Talented chalkboard artist Valerie McKeehan provides useful coloring tips and tricks, along with beautifully colored examples to help get you inspired. Each design is printed on one side only of high-quality, extra-thick paper, perforated for easy removal and display. Valerie also has a shop on Etsy here to buy her gorgeous prints and designs. I am keeping this page updated as new books come out and these are the one’s I’m excited about checking out, let me know in the comments if I have missed any of your favorites that you are excited about! All these romantic coloring books would be perfect Valentines Day gifts for your special someone, Mom, Dad, Kids as well as grandparents and co-workers. You might want to take a look at the coloring supply suggestions as well.